Fourty-one readers love this post. Simply change up the way you serve a White Russian and you’ve got a Ghost in the Graveyard Cocktail. 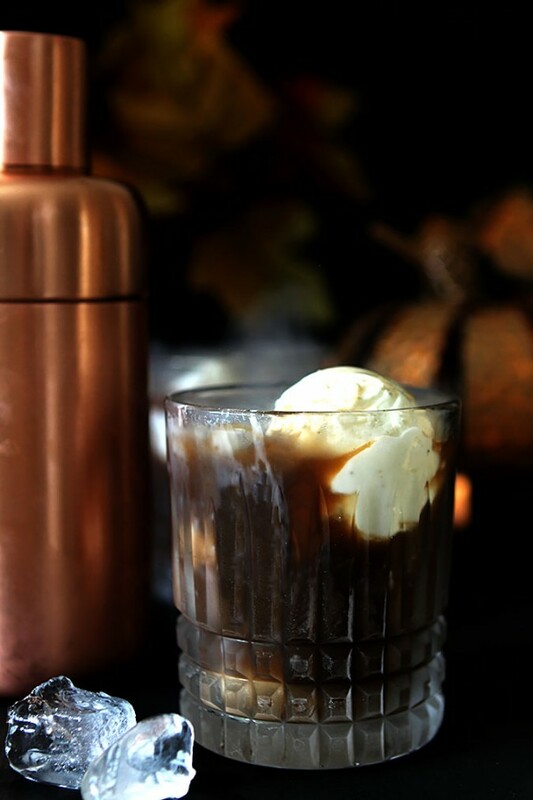 It’s a fantastic dessert cocktail with vanilla ice cream, black vodka and coffee liqueur. I know, I’ve mentioned I do not love Halloween and it’s never a holiday that I’ve devoted a lot of time and attention towards. Honestly I wish I knew why it’s so ‘meh’ for me but I have some guesses. I have never been a fan of scary anything, the scariest movie I think I’ve ever seen is the Wizard of Oz and though that impression is one from childhood, I’m OK if that’s the worst for me. I can’t even stand commercials for scary movies and nightmares are not something I want to help along! I also don’t like the color orange. Nothing about it. It’s harsh and not pretty and looks especially bad with black. So the idea that I’m supposed to decorate my home with colors I despise together has never appealed so my ‘holiday’ decorations are limited. Give me Christmas please…burgundy and green are SO much more up my alley! Still, I’m a team player so I put on my thinking cap and decided it was time for another Halloween cocktail. Honestly? I cannot stand those foods that people make that look like body parts and if I’m not willing to go full throttle, then I’ll punt and do the one thing I can do with a ghoulish theme and that is to make a cocktail. I decided I could handle this Ghost in the Graveyard Cocktail. 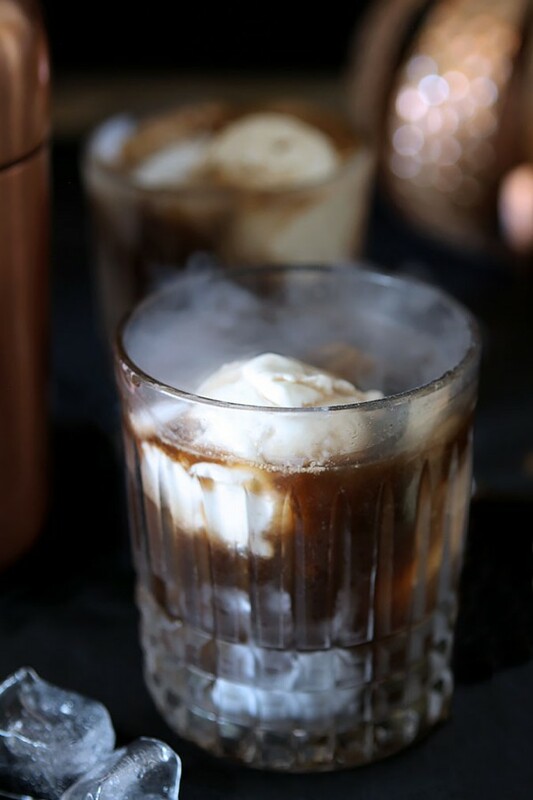 Combining vodka with coffee liqueur and half and half is a favorite after dinner sipper; subbing out the half and half for ice cream in this cocktail was right up my wussy ‘I don’t want it scary’ mantra! I got together with a local blogging friend, Ansh who blogs all things Indian and more at Spiceroots. As luck would have it, she has recently changed her schedule at her job and had some time off so we thought it would be fun to get together to do some cocktails. If I enjoy doing this alone; imagine how much more fun it is with someone else here adding to the mayhem. There was laughter; lots of it. Ansh will be including her cocktail in next weeks version of Progressive Eats…but I couldn’t wait that long. There is Friday and I promise cocktails doggone it! We both decided to create a cocktail using Blavod Black Vodka. It should be called ‘Sort of Black Vodka’ because it’s certainly dark but it’s not what either of us would call black. Blavod Black Vodka gets its unique color from Black Catechu – the resin of the heartwood of the Acacia catechu, a tree indigenous to India and Burma. It’s a bit more really dark brownish gray…that’s the best we would give it. Blavod is made in the UK and imported to the states. Still; it does add a dark component that when combined with other ingredients gives a much spookier effect than regular vodka would but honestly? Now that I’ve found it and used it I can’t insist you do the same; for this drink coffee liqueur is plenty dark enough. I should have had the Rolling Stones on advising us to ‘Paint It Black’ and it would have been the perfect musical accompaniment. My cocktail is really a dessert drink and on any other day a similar combination of ingredients would be called a White Russian, a very popular dessert cocktail. But I’ve made it a bit differently and used a scoop of ice cream to replace the cream with the intent of having it be the ‘ghost’ in the name. Same great flavor but just enjoyed a bit differently; you might want to serve it with a spoon! The effect of dry ice pouring off this drink was cool but I did learn that the effect is pretty short lived, so consider it optional. I had to keep replenishing it and ultimately almost froze my drink solid to get photos. 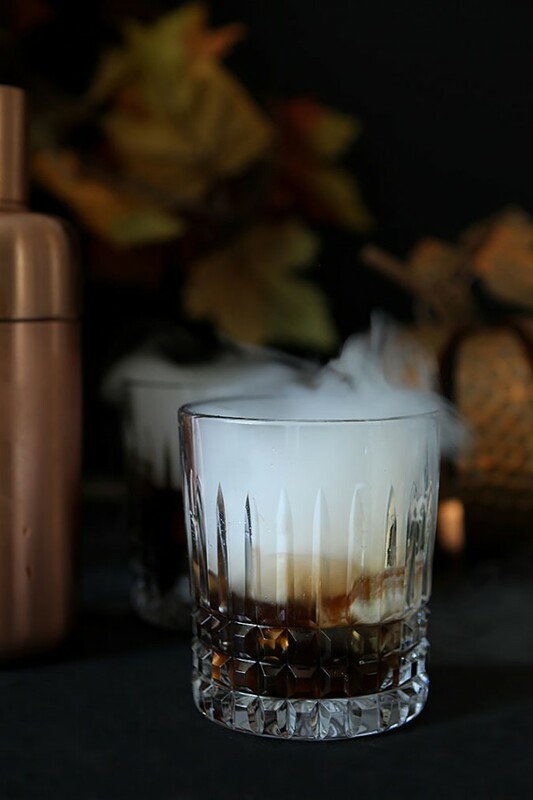 Also, while it won’t kill you to ingest the dry ice, it is so cold it can burn; so if you use it, do wait until your cocktail has stopped smoking like the photo above; better safe than sorry. And SO cold. Future efforts and I will find a way to have the billowing smoke surrounding a cocktail but never again IN it…brrrrrr that sucker was COLD! This one is easy and delicious; my kind of party drink. I’ll be sipping on one while I await the kiddos in my witch costume. Yes, that I do have; I do Professor McGonagell proud. I wish all of you a fun and not especially scary Halloween…and be safe out there! Place a couple of pieces of dry ice in the bottom of a rocks glass. Top with a scoop of vanilla ice cream. Fill a cocktail shaker halfway with ice and pour vodka and coffee liqueur into the shaker and shake until cold. Pour over the ice cream in the glass. The post Ghost in the Graveyard Cocktail appeared first on Creative Culinary.